AL-‘ALEY is He to Whom infinite Highness is attributed. Compared to Him, everything is mean and servile; Allah is Most HIGH above having partners or foes; His rank is infinitely Great, He is the Supreme over His creatures with His Power and Might. 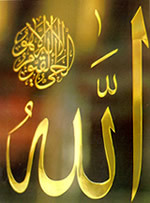 As Allah is Exalted, then His Self can not be grasped or encompassed by human or created mentality. The name AL-‘ALEY is derived from the Arabic noun ‘olow (which means being high), its direct opposite is sofl (which means being low), both the word and its opposite are applicable to concrete as well as to abstract degrees. Anything that has highness in rank orintellectual degrees, must have a high rank in comparison with that towhich it is compared, so we say, something is higher than the other, eitherin place or in rank. The human being is higher in rank than the animal, the alive ishigher than the dead, the people who are chosen by Allah are higherthan the ordinary people, angels are higher than human beings, and themaker is higher than what he makes. On contemplating Allah’s Attributes, you find that He is the Creator eternally and permanently with no beginning and no end; He had been existing when everything had been non-existent, thusHe is the Most HIGH, Glory be to Allah, Praise and Glory beto Him. He is Allah.